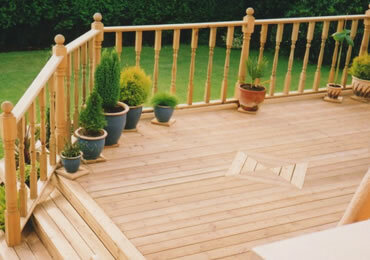 We make garden decking for all sizes of garden to suit all budgets. 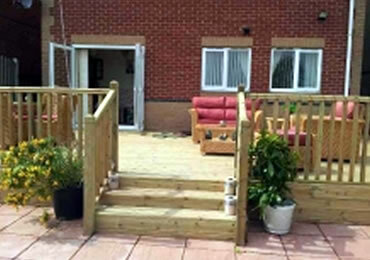 We can create all types of wooden decking designs from simple to intricate. Why not transform your garden with a beautiful decking or paving area? We supply only or supply and erect top quality decking boards at only £1.90 per meter and best of all we do not charge vat. Our 125mm x 32mm decking is pressure treated and is available in 2.4m, 3.0m, 3.6m, 4.2m, 4.8m and 5.7m lengths. Our paving stones are 18" x 18" and come in 3 colours, grey, buff or pink. Take a look at our gallery photos and see for yourself the quality of our workmanship and products.